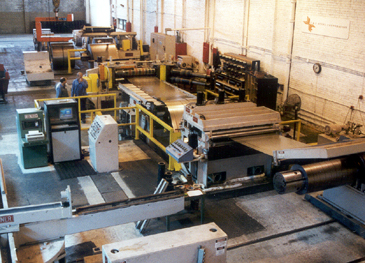 J&F Steel's latest investment in its Evanston, IL, facility is a high performance Braner/Loopco "Turret head" Slitting Line, designed to produce high quality precision tolerance slit coil at 1,200 FPM. The line will handle 40,000# x 60" wide coils of prime coated and bare cold rolled steel in gauges from .010" thru .187" and will produce slit coils to 72" diameter on I.D. 's of 16" and 20". The line includes several features designed to enhance productivity while maintaining product quality. A three (3) head Turret Slitter reduces slitter head changeover time to just a few minutes for efficient JIT scheduling and shipments. Speed-Load arbors on the tension Stand and the Overarm Separator can be changed as fast as the Turret Slitter. Entry and exit coil storage Turnstiles stage coils fore and aft of the slitting line, eliminating time lost to crane availability. The scrap system allows hands-off disposal of scrap bundles into a large container, reducing time lost to scrap handling. The Turret Slitter is equipped with a DC drive that allows precision single loop slitting and drive assist slitting, depending on the gauge and coil shear strength. 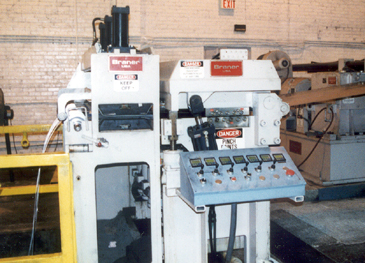 Shimless slitter tooling on all the precision slitter heads guarantees tight tolerance slit coils. An adjustable resistance Tension Stand in conjunction with a high torque Recoiler produces uniformly tight, straight wall slit coils. The line is also equipped with Braner/Loopco's patented Cluster Leveler. This device is capable of correcting strip shape defects such as wavy edges and center buckle, and correcting slitter induced cross bow. The result is a flat rectangular strip cross section with minimal edge burr. Offset hardened and chrome plated work rolls, supported on multiple independent rows of adjustable back-ups, elongate the strip in concentrated areas to stretch-out waves and buckles. Cross bow is eliminated by successively flexing the strips over and under the work rolls. Without question, the quality of slit coil processed through the Cluster Leveler is superior to non-leveled strip. The leveled strips have minimal burr, are uniformly flat, with virtually no difference between burr up and burr down coils. This improved strip shape makes leveled coils easier to form and fabricate than ordinary slit coil. J&F Steel operates coil processing and distribution plants in Chicago, Burns Harbor, IN, Grand Rapids, MI, and Middletown, OH, in addition to its Evanston headquarters plant.